Summer is flying by! It's hard to believe that it will be JULY when I post my Camp Mom recap next week!!! 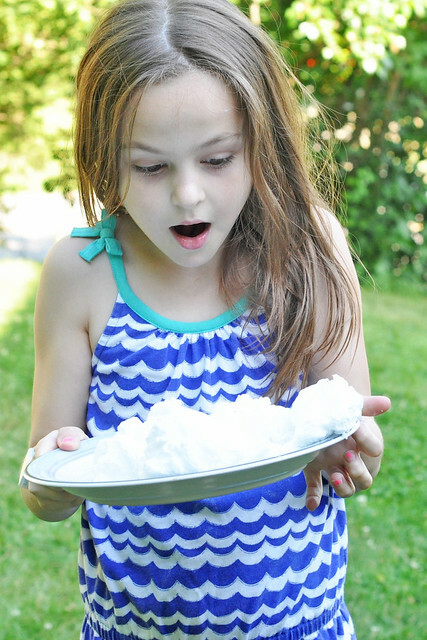 My kids LOVE this fun science experiment! No matter how many times we do it, they are still amazed. It's a really easy project-all you need is a bar of Ivory soap and a microwave! Unwrap bar of soap and place on a microwave-safe plate. Microwave for 1-1 1/2 minutes. Stand by and watch as the bar of soap expands into a cloud. You will know when to stop the microwave! Remove plate carefully! The plate and the clump of soap left in the middle can get really hot. The cloud will quickly deflate a bit, but make sure the kids get the chance to touch it. It has a very neat texture! *Note: If your child is going to play with the "cloud" remove it from the piece of soap that remains first. That remaining piece is very hot. You can continue to microwave the piece of soap that remains until it completely disappears. It will do the same thing each time! 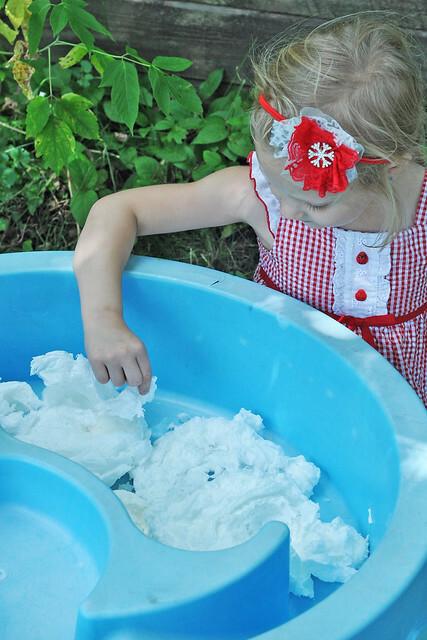 We microwaved 4 bars of soap and transferred the "clouds" to our water table for some sensory play! As the kids played, the soap cloud gradually turned into a fine powder. My kids played for over an hour. 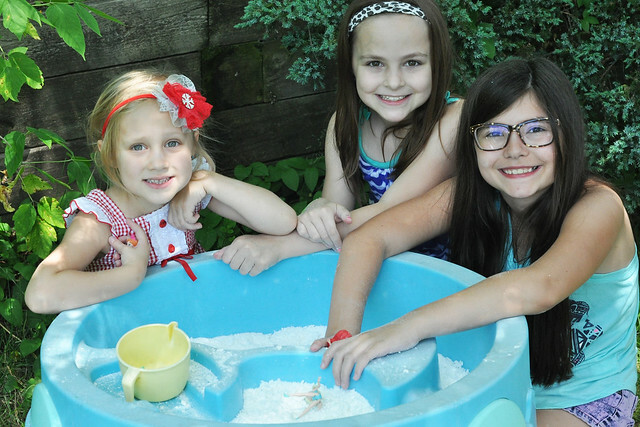 They molded and scooped, and after it turned into a powder, they made it "snow" and brought out a few Frozen figures! I first saw a version of this on Pinterest, but the idea of giving my kids squirt guns filled with paint did not sit well with me! Haha! Call me a REALIST. I came up with a fun alternative! I strung a clothesline between 2 trees and clipped watercolor paper to the line using clothespins. 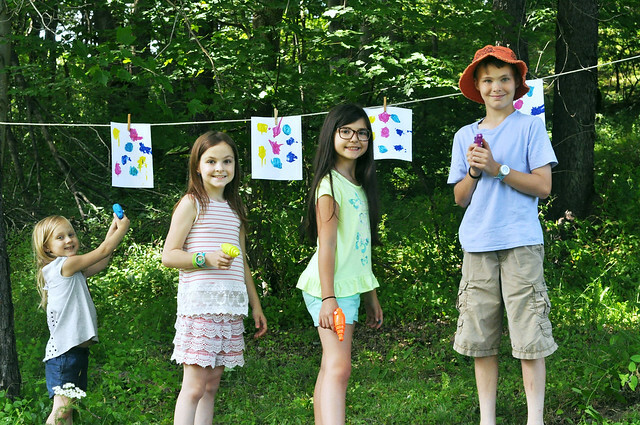 I had the kids slap a few globs of paint onto their paper, then handed them squirt guns filled with water. 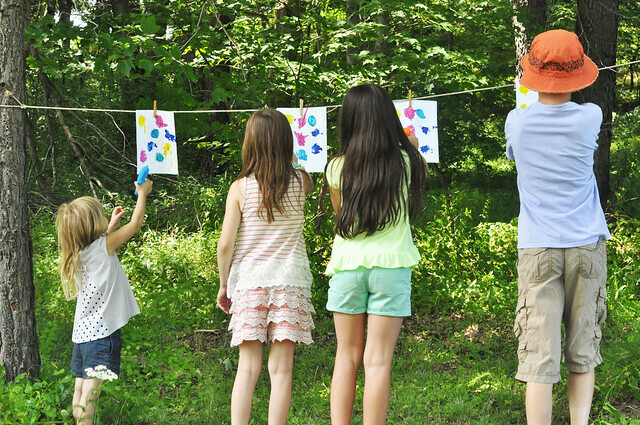 The result was watercolor paintings that took a million hours to dry, but they had a blast! Sometimes the simplest things make kids happy! 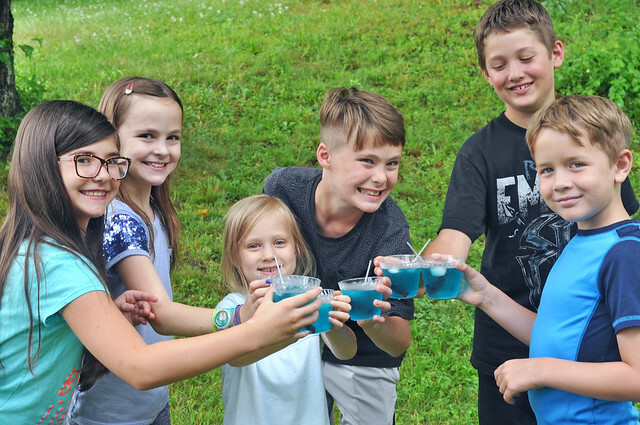 ...made a fun drink for kids! Pour the juice into a clear cup. 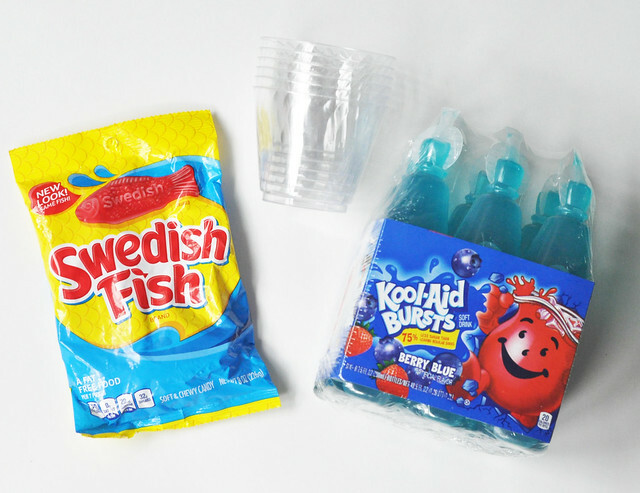 Skewer the swedish fish on clear plastic straws. 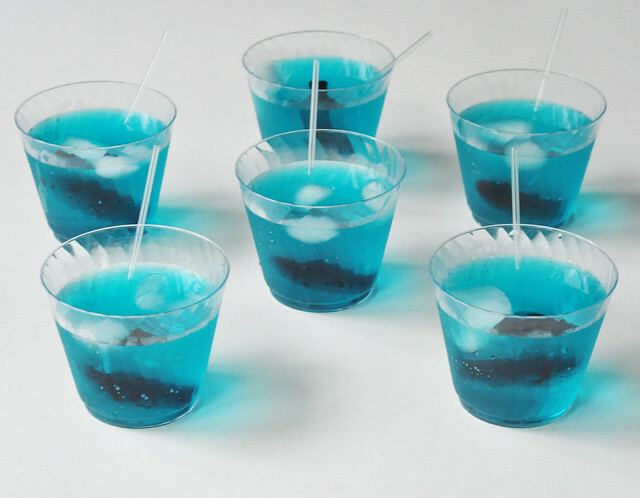 Add the straws to the drink and enjoy! 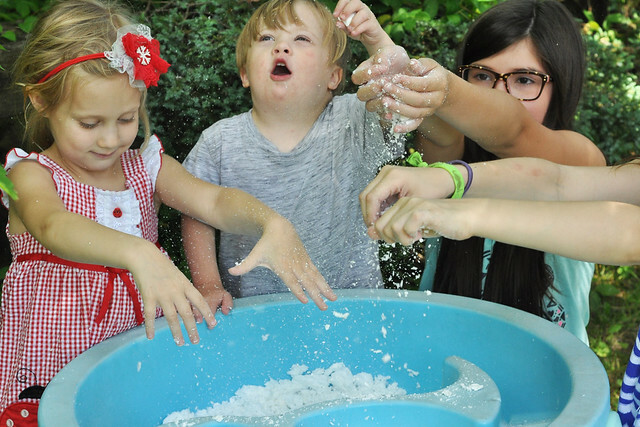 We saved this activity for a really hot day! It was a great way to cool down! Find an open spot to hang a long string. 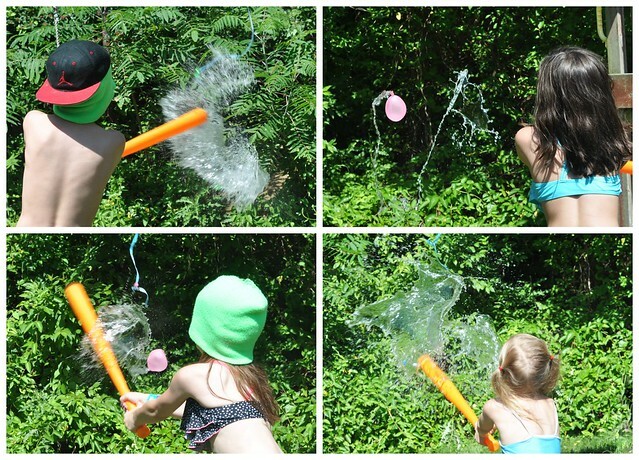 Tie the end around a water balloon. 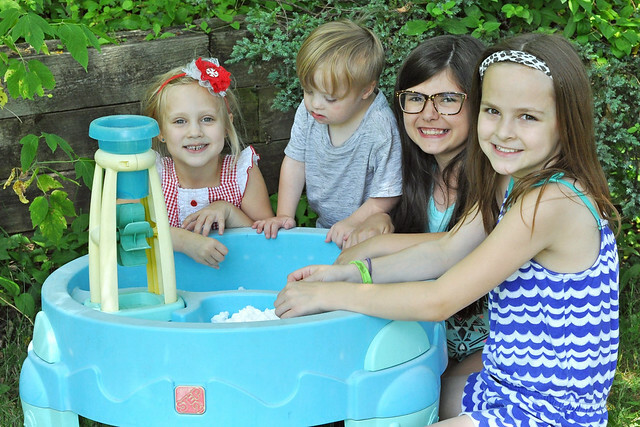 Go in rounds from youngest to oldest. Let the child swing until they break their balloon! Repeat until all balloons are gone! Sometimes you just need to go on a "field trip" and escape the house! 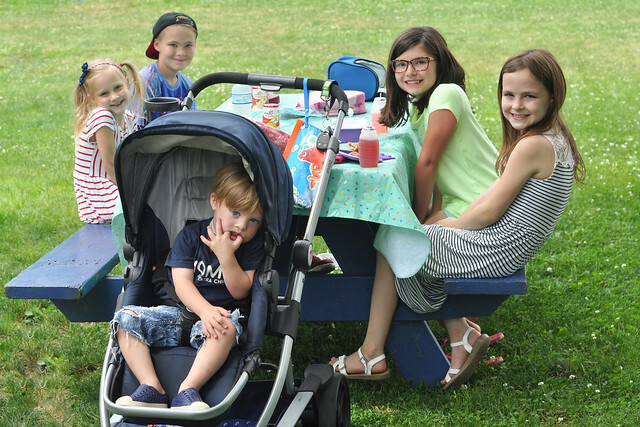 I had each kid (except for Liam) pack an entire lunch, then we loaded everything into the SUV and headed to the nearest park for a picnic. Everyone returned home tired. SUCCESS! What is your favorite thing to do in the Summer? 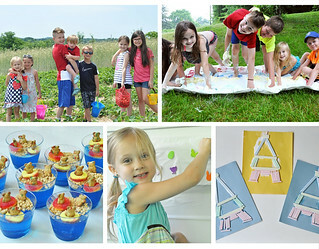 These are such fun activities! I think my boys would love the cloud experiment. Thanks so much for sharing! Thank you, Cat! 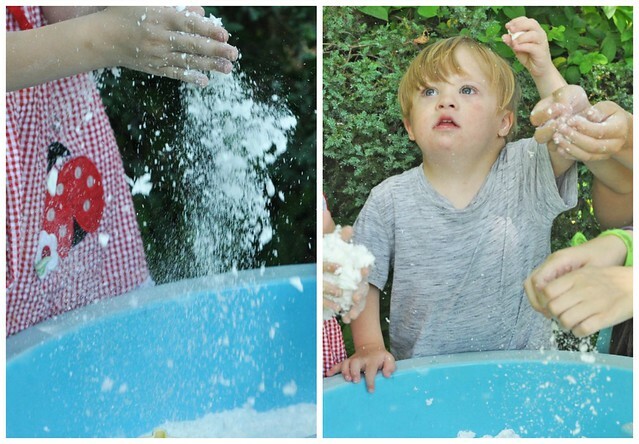 The soap clouds are a hit every single time! Thank you so much! It is really neat to watch it expand! Oh how cool! I’ve never heard of microwaving soap. I bet Mason would love that! These are all great ideas! Adorable photos, too! Thank you! I'm certain he would. My kids get a kick out of it every time we do it! So fun! I've always wanted to try the soap thing. We may have to! WHAT?! I had no idea that a bar of soap would do that! 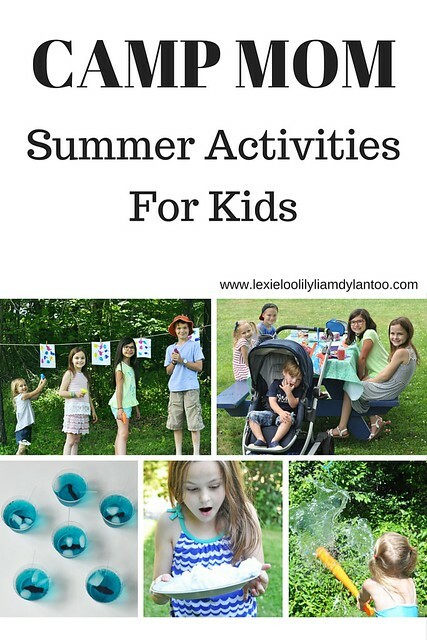 You are just on FIRE with the kid activities this summer! The kids are never going to want to go back to school! I'm sure I'M going to be tired by the end of Summer! Goodnight, you've got the best ideas around!!! That soap trick is amazing! I've got to do that with my grandson, he'll flip. Also, the paint squirt guns - great switch up on that one, I'm a REALIST too. I liked your idea best! Thank you so much, Ruthie! After having 4 kids, I know to expect ANYTHING. Paint in squirt guns probably wouldn't have ended well! I hope your grandson enjoys making soap clouds! You are so creative! I love all of these! 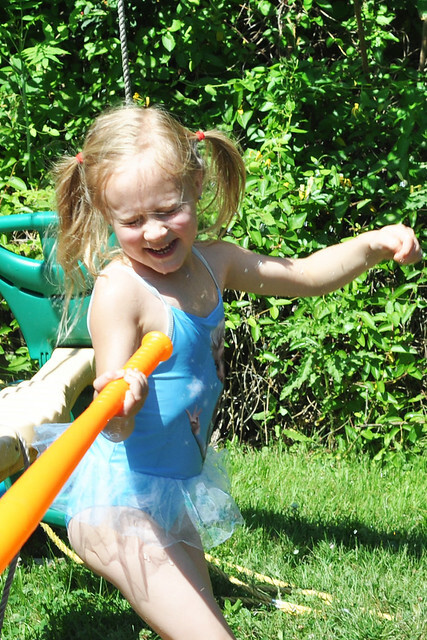 We are going to play water balloon baseball. Love these! Ive always wanted to try Ivory soap in the microwave! I think I may have a bar stashed somewhere, actually... You are the coolest mom! Awww, thank you! You should definitely show your girls the soap trick! How could it possibly be another week already?! I am really liking those ocean drinks. Those are totally the right colors for the 4th too :). Right?!? 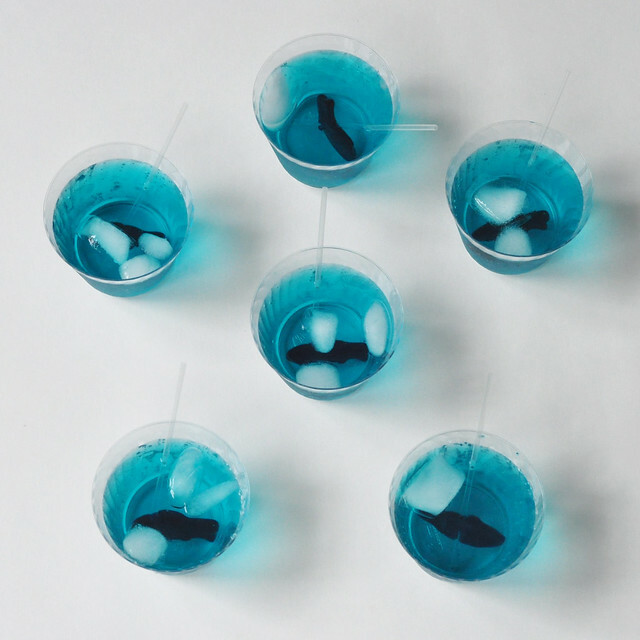 We made ones last year with red & blue ice cubes! Soap clouds! I'm totally doing this with Liam; it looks so fun! We want to come play! 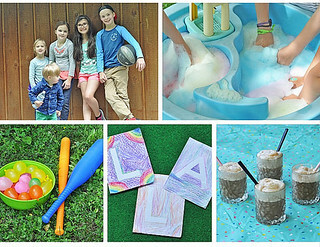 You are doing so many fun activities! Thank you, Amanda! I have exploded marshmallows in the microwave before...on accident! Haha!